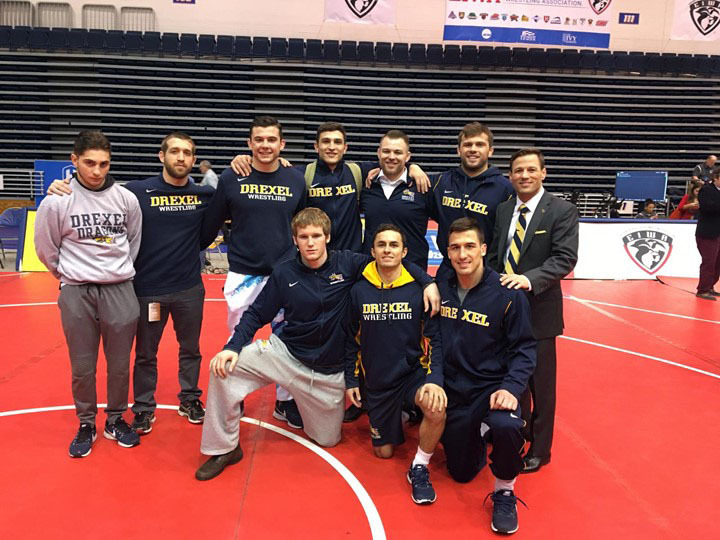 The Drexel University wrestling team ended their regular season with the Eastern Intercollegiate Wrestling Association championship March 3-4. It was hosted at Hofstra University in Hempstead, New York. Drexel sent many wrestlers to the competition, and ended up placing seven wrestlers and fourth as a team. On day one, top-seeded freshman Austin DeSanto wrestled in the 133 pound weight class. He started off pinning Franklin and Marshall University’s Dan Martoccio within the first two minutes. He then had a 22-7 technical fall win over Brown University’s Hunter Kosco. This moved DeSanto to the semifinal match against No. 4 Chaz Tucker from Cornell University. Tucker, however, got the best of DeSanto with a late takedown to win 4-2. DeSanto used this loss to easily go past Binghamton University’s Jacob Nicholson by injury default. He then continued onto the third place match against No. 3 Josh Terao, whom he beat by a close margin earlier in the season. This matchup brought similar results, as he defeated him 10-8 to place third. Graduate student Garett Hammond was also very successful at 157 pounds, as he easily got a major decision over his first opponent, Bucknell University’s Christian Bessolion. He then moved onto Cornell’s Fredy Stroker, whom he also moved past with a major decision to move Hammond into the semifinal match. In this match, he faced Princeton University’s No. 1 Mike D’Angelo. Here is where Hammond was stopped as D’Angelo came out with a 11-3 major decision. Hammond then moved onto the consolation match, where he grinded out a 3-0 win over University of Pennsylvania’s Joe Velliquette to move onto the third-place match against the United States Military Academy’s Lucas Weiland, whom Hammond beat 5-3 to also place third. Redshirt senior Zack Fuentes started off the day with a 14-4 major decision in the 125 pound weight class over Sacred Heart University’s Ryan Burns. He didn’t have as much luck in the next match, as he dropped a 3-1 decision against Binghamton’s Joe Nelson. He then, however, rebounded from this loss to get a 9-1 win over Bucknell’s Geo Barzona. The next day, Fuentes started off with a 2-0 win over Nolan Hellickson of Harvard University. He also won the next two matches, 8-0 and 3-1, from the second and third placed wrestlers from West Point and American University, Try Chlifoux and Gage Curry, respectively. This placed Fuentes third in the match, the third person to do so from Drexel. Redshirt junior Stephen Loiseau also fought through the consolation match to place third, the fourth Drexel wrestler to do so. He started off just like Fuentes with a 8-1 decision over Bucknell’s Chad Reese. He then lost the next match, 11-3, against a tough opponent, No. 3 Frank Mattiace from Penn. He bounced back to beat Columbia University’s Michael Bulkin 10-4, to move him up from the consolation match. On the next day of competition, Loiseau began in huge fashion with a 14-2 major decision over Brown’s Tucker Ziegler. He outlasted Lehigh University’s Chris Weiler 5-3 to move to the third place match. Here, he faced American’s Jeric Kasunic, whom he beat 3-2 to place third. Three other Drexel wrestlers participated in the match: redshirt sophomore Ebed Jarrell and redshirt seniors Alex DeCiantis and Austin Rose. Jarrell started off the day just as the other wrestlers did, with a 11-1 major decision over DJ Hollingshead of Bucknell. A second round matchup against Cornell’s Jon Jay Chavez ended up in a 10-5 loss, putting Ebed in the consolation match. Here he earned a major decision over Anthony Wokasch to move onto the next day. He lost to Lehigh’s Gordon Wolf, but then rebounded with a win over West Point’s Andrew Mendel to get seventh. Austin Rose also earned seventh in the competition, who started off the first day with a 16-3 major decision over Hofstra’s Sage Heller. He almost beat top seeded Jordan Kutler of Lehigh, but ended up losing 2-0. He then won the next match 6-0 to move onto the next day. Rose also lost his first match of the second day against Columbia’s Tyrel White, 5-2, but redeemed himself in the next match, placing seventh with a win over Sage Heller. DeCiantis started off his competition strong like every other Drexel wrestler with a huge 19-4 technical fall victory over Franklin & Marshall’s Steven Mercadante. DeCiantis then fought against Lehigh’s CJ LaFrogola, who overcame DeCiantis 4-3. He then came back with a 15-4 major decision over American’s Connor Allshouse. The next day, he won his first match 10-6 to move onto the Naval Academy’s Michael Coleman. Here, DeCiantis lost to Coleman and moved onto the fifth place match, where he medically defaulted to earn sixth place. The four Drexel wrestlers who placed third at this championship get a chance to face off in the National Collegiate Athletic Association championships in Cleveland, Ohio March 15-17.